What the team is known for Top-tier competition practice noted for representing both international and domestic clients in proceedings before the Hellenic Competition Commission. Additionally reputed for handling state aid issues. Increasingly active in private enforcement and regulatory compliance issues. FCC Construction is a new client win for the department. Strengths One client expresses satisfaction with the team's dedication to a case, saying: "All the people from the firm that I worked with were excellent lawyers. I found them very thorough in searching for resolutions for our case, and felt as though we could trust them entirely." Work highlights Advised Hondos Centre on an investigation on a selective distribution channel in the cosmetics industry led by the Hellenic Competition Commission, which was resolved by way of a settlement agreement between the parties involved. 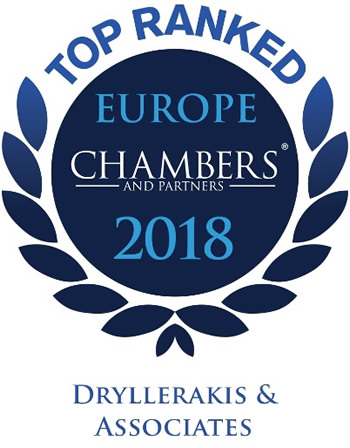 Managing partner of the firm John Dryllerakis is recognised for his long-standing experience and in-depth knowledge of competition law. Clients appreciate his "very high level of legal support" and add: "He led the team, had a very good vision of the case and always followed the matter through. He responded extremely quickly." He has experience serving as a member of the Hellenic Competition Commission and regularly represents clients in high-profile investigations and disputes. He acted for LARCO Mining & Metallurgical on its defence of a claim for recovery of allegedly incompatible state aid totalling EUR136 million. Cleomenis Yannikas frequently handles high-profile antitrust cases and is known for his talent as a litigator before the courts and the Hellenic Competition Commission. He defended a group of poultry suppliers before the Athens Administrative Court of Appeal against allegations of horizontal anti-competitive agreements. Clients praise his "very strong knowledge of the market situation in commercial issues" and describe him as "pragmatic, innovative and solution-driven." Emmanuel Dryllerakis specialises in competition law and M&A transactions, and is highly active in cartel disputes and investigations. He represented Christopher D. Constantinidis in an investigation relating to an alleged construction cartel in the Greek public works sector. Sources highlight his "clear mind and vision" and add that he offers good strategic advice and management skills. What the team is known for Popular with clients from the real estate, hospitality, energy and retail sectors. Acts for buyers and sellers on M&A transactions, both at a domestic and international level. Assists with due diligence, shareholder matters and corporate governance. Clients benefit from the firm's close collaboration with its strong competition department. Strengths Clients highlight the team's "commitment, dedication, very deep knowledge, co-operative spirit and teamwork." Work highlights Advised SOCAR as successful bidder on the privatisation of DESFA. Significant Clients Libra Group, Beiersdorf Hellas, Tesa Tape, Diageo Hellas, Sunlight Systems. John Dryllerakis is "one of the most respected figures in M&A," according to market sources. He boasts broad experience, advising on shareholder agreements, corporate structuring and regulations as well as M&A. According to clients, Emmanuel Dryllerakis has "a lot of common sense, is very sharp and very cool in moments of crisis." He regularly acts on privatisations, M&A and structuring matters. He recently advised a European energy group on its acquisition of an RES portfolio. Cleomenis Yannikas advises clients from the energy sector on M&A, privatisation and project finance matters. He is also experienced in the real estate sector. Clients appreciate his "very good co-ordination capacity and ability to provide solutions in complex legal cases." He assisted the Dimera Group with the acquisition of a majority stake in SOUROTI. What the team is known for Market-leading firm handling both litigation and arbitration work. Has capabilities in diverse areas of civil and commercial litigation, with particular strength in contentious tax and competition matters. Senior partners act as arbitrators as well as counsel on domestic and international arbitrations. Unilever is a new addition to the group's list of clients. Strengths One client says: "They have a deep knowledge of our business and extensive experience in arbitration. They are very responsive to our queries and always make themselves available." Value for Money Multiple sources praise the pricing of the group's legal services: "They have reasonable fees from the top partners down." Work highlights Acted for the Hellenic Financial Stability Fund as claimant on civil and criminal law proceedings relating to allegations of fraud, embezzlement, corruption and tortious behaviour. Significant Clients Regency Entertainment, LARCO, Siemens, Minoan Lines, Hellenic Petroleum. Clients praise John Dryllerakis's significant experience and "deep knowledge" of the market. His practice encompasses a range of commercial litigation, public law and regulatory disputes. He also receives plaudits for his prowess in international arbitration, often acting as arbitrator. John Damilakis is a highly experienced litigator and arbitrator, described by interviewees as a "well-known and reputed lawyer." His disputes have involved contract terminations and damages claims. Gerassimos Apergis handles contract disputes and white-collar crime litigation, including enforcement proceedings. Clients admire his passion and tenacity, advising that he "never gives up the fight." His recent cases have involved fraud and money laundering. Panagiotis Kakaletris deals with contentious matters in a range of sectors, often assisting clients with commercial and civil law disputes. Sources praise his ability to "prepare and relax the witness for hearings." He also advises clients on public procurement disputes and anti-corruption. What the team is known for Strong employment practice advising international and domestic clients across a variety of industry sectors. Assists with matters ranging from M&A-related employment due diligence to social security issues. Additional experience of dismissal cases and other contentious labour law matters. Also offers expertise in data protection and EU regulatory topics in employment law. New client wins include Heidelberg Hellas. Strengths One client highlights the team's "deep knowledge on labour issues," as well as the practitioners' "very friendly approach" and "customer-oriented attitude." Work highlights Assisted Henkel Hellas with matters relating to collective redundancies, group dismissals and restructuring processes, including the termination of high-level employees. Sophia Grigoriadou handles employment law mandates related to social security issues. One client praises her "excellent performance," while another highlights her customer-focused approach. Her projects of late have involved data privacy matters. What the team is known for Well-known group reputed for handling complex and high-profile transactions in the real estate area. Noted for deep knowledge of zoning, planning, property use, permitting and licensing. Additionally advises on contentious real estate mandates, including tax and criminal investigations. Other areas of expertise include the negotiation, renegotiation and termination of leases. Its roster of clients includes a range of entities from the retail and tourism sectors, particularly hotels. Strengths One source appreciates that the lawyers give "very solid, clear advice," while another client likes the fact that "they think outside the box." Work highlights Advised Lamda Development on matters relating to the Hellinikon project. Assisted Lampsa with its participation in a tender for the lease of a building in central Athens. Voula Anargyrou is widely recognised by sources as a "very experienced" practitioner in the real estate arena. She is knowledgeable of lease agreements and property acquisitions, with recent deals involving the purchase of office real estate. Sophia Grigoriadou is a strong choice for contentious real estate issues and litigation proceedings, with experience of disputes pertaining to lease terminations and construction law. One client says: "She is always there, quick and to the point." This source also praises her ability to co-operate with counterparties. What the team is known for A widely respected and long-established tax department with strong practical experience litigating before the administrative courts. Offers comprehensive advice on all aspects of tax law, including general tax advice, tax planning and criminal tax investigations. Also knowledgeable of VAT and stamp duty topics. Acts for clients from a variety of sectors, such as telecommunications, banking, consumer goods and manufacturing. Strengths Clients laud the team's expert understanding of the tax arena: "They have an exceptional knowledge of the frameworks and possibilities." Work highlights Represented the Greek subsidiary of Pirelli in an appeal relating to the imposition of proportional stamp duties. Managing partner John Dryllerakis frequently represents clients in contentious matters involving a whole host of tax issues, such as corporate income tax, VAT, real estate transfer tax and fraud. He also offers advice on the tax implications of restructuring processes, and assists high net worth individuals as well as companies. His experience includes acting for Eurobank Ergasias on various tax litigation matters. He is widely respected for his tax expertise, with sources describing him as "an experienced practitioner." According to one source, Sophia Grigoriadou is "a truly bright tax lawyer" who is "very well organised and tough." She leads the department and demonstrates expertise in a variety of tax litigation mandates, including transfer pricing, VAT, stamp duty and bankruptcy-related cases. Her practice also extends to assisting with corruption allegations, such as carousel fraud. Another interviewee describes her as "client-oriented and effective" and highlights her "technical knowledge."